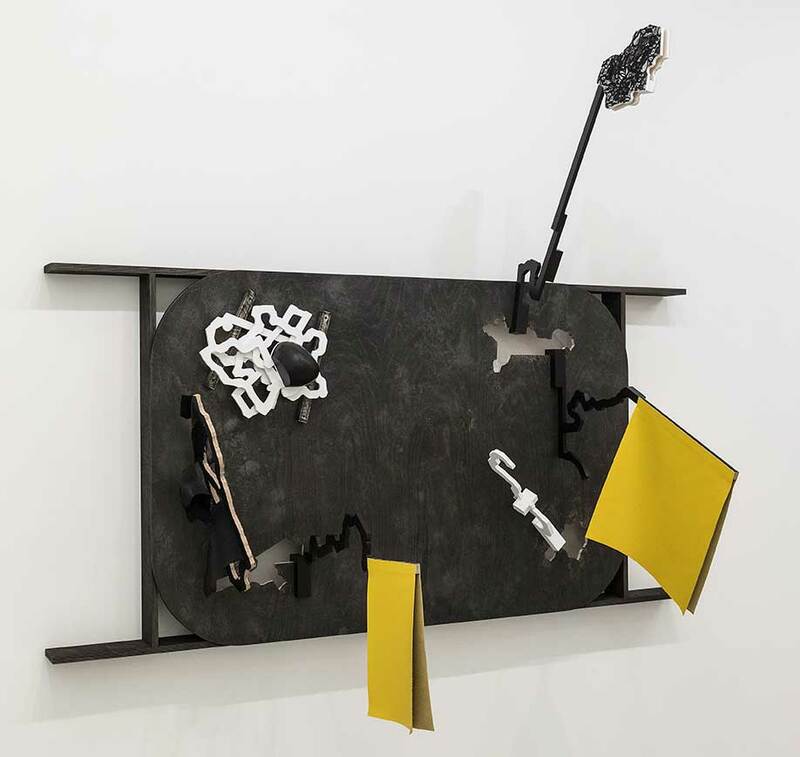 Dominant in Thomas Bang’s exhibition of recent work at FOLD, where eight sculptures as upright as paintings are pinned to the walls, is a concern with how sculpture relates to its supports. In fixing all the works to the gallery walls he questions the distinction between those two most traditional of media: painting and sculpture. Some, like ‘Toward Other Possible Conditions #2’ (a diptych of oval plywood panels, one painted green and one unevenly sprayed black) are almost as flat as canvas on stretcher. However, both panels are defined by broken planes. The green has shapes sawn out so we are not sure whether to look through the sculpture to the wall behind or to focus on the green expanse. Like a painting, this sculpture asks to be viewed from the front. But the black plane, whilst also punctured, has plywood shapes screwed and placed so that they thrust forward into three-dimensional space – only thinly visible if you stand directly in front of the work. Other works, like ‘Towards Other Possible Conditions 1’ (2012) and ‘Intruder, No. 2’ (2014), seem to be made up entirely of frame. The space in the middle of these works dominates when looked at directly. Instead of an image we are faced with a space agape, surrounded by stacked painted plywood up to four sections deep. Attached to these layers are bits of leather and textile that hang loose. Wood melts into leather. The press release for the exhibition notes that since seeing an example in Copenhagen in 2009 Bang has been inspired by Egyptian funerary portraits. Often painted on panel, these Antique Greco-Roman portraits are of particular historical interest for the way in which they combine the realism of classical painting with Egyptian mummification. Their relevance to Bang’s works is that they occupy a liminal space between painting and sculpture. These are the oldest still surviving examples of painting technology and what is most striking bar their realism, is the wood of the panel upon which they are painted. The bare wooden edges of the paintings give these objects a definite sculptural quality like one of Jo Baer’s ‘Wraparound’ paintings of the late 1960s and early 1970s, in which the American artist explored where a painting might begin or end. Bang came to prominence in the 1960s as part of the anti-form tendency in sculpture. Many of the artists associated with this preoccupation were brought together in Harald Szeemann’s 1969 exhibition ‘When Attitudes Become Form’, and Bang continues to query what it is that constitutes a medium. This extends to the Egyptian funerary portraits themselves. Recent analysis of the portraits has shown that some wood for the panels came from as far away as Northern Europe, giving us an insight into the extent of the trade networks of Ancient Egypt. Just as scientific scrutiny gives prominence to the panel, Bang’s sculptures also bring the support to the fore.